North Carolina Congressman Walter Jones is a conservative backer of fair elections. Big Money wants him out of the House. In Washington, however, Republican reformers are harder to come by—as was evidenced by the celebrations of the Supreme Court’s McCutcheon v. Federal Election Commission ruling by GOP congressional leaders. Leaving no doubt about his faith that those with the most money get to speak the loudest in our elections, House Speaker John Boehner, R-Ohio, hailed the Court’s decision to strike down limits on aggregated campaign donations by wealthy Americans with an announcement that “freedom of speech is being upheld.” At the same time, one of the attorneys who argued for elimination of the cap on aggregate donations said Senate Republican Leader Mitch McConnell—who Kentucky media noted “filed an amicus brief on the McCutcheon v. FEC case as a part of his continued crusade against campaign finance reform”—had been “extremely helpful” in pushing the court to go even further than McCutcheon’s legal team had initially proposed. Yet, despite Boehner’s enthusiasm and McConnell’s ambition, the party leaders do not speak for every Republican in Washington. Three years ago, Congressman Walter Jones, R-North Carolina, signed on as a co-sponsor of one of several proposals to amend the constitution in order to renew the power of the people and their elected representatives to regulate money in politics. More recently, he co-sponsored a proposal by Congressman Jim Yarmuth, D-Kentucky, to develop public financing for congressional elections. Jones is on board with Government By the People Act of 2014, a “matching-funds” plan offered by Congressman John Sarbanes, D-Maryland. And he is the only Republican co-sponsor of the Empowering Citizens Act, a plan by Congressman David Price, D-North Carolina, to renew the public financing system for presidential elections. On his own, Jones has sponsored legislation to bar the use of political funds for personal purposes. Griffin’s gripe with Jones appears to be that the veteran congressman is too independent-minded. And it is true that Jones breaks rank with party orthodoxy. For instance, he has been one of the most outspoken critics of US military adventurism, often working with Congresswoman Barbara Lee, D-California, on issues of war and peace. This has put him at odds with the Bush and Obama administrations, and more recently with House Budget Committee chairman Paul Ryan, R-Wisconsin, whose 2013 budget Jones said was too lavish in its funding of wars. But Jones is hardly a left-winger. He echoes the “old-right” language of conservative icons such as former Ohio Senator Robert Taft Sr. and former Nebraska Congressman Howard Buffett, and of some younger libertarian-leaning House members such as Michigan Republican Justin Amash. Now Jeff Connaughton, the former Senate aide who wrote the book The Payoff: Why Wall Street Always Wins, suggests that Jones’s independence has earned him a challenge from Griffin in the May 6 Republican primary. 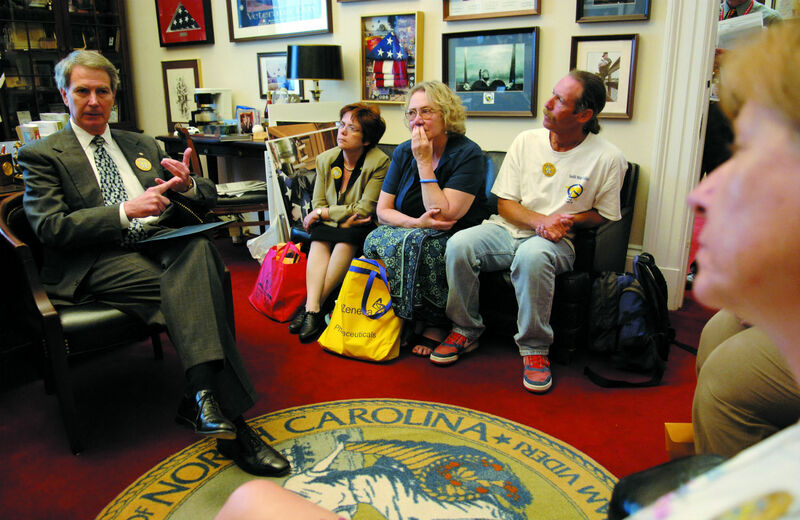 “I doubt anyone in North Carolina needs me to point out this is a Wall Street bank hit job,” says Connaughton, who helped frame the fight for the 2010 Dodd-Frank financial regulation law. Bloomberg reports: “JPMorgan Chase (JPM) & Co., Bank of America Corp. and Wells Fargo & Co. (WFC) are lining up behind Jones’ primary challenger, Taylor Griffin, an aide in President George W. Bush’s Treasury Department who later worked for groups that advocated in Washington for the biggest financial services companies.” Former Republican National Committee chairman and Mississippi Governor Haley Barbour, a top lobbyist, is a Griffin donor, as is former Bush White House spokesman Ari Fleischer. Indeed, observes Politico, Griffin has had a cash influx from some of the most high-profile Republican lobbyists in Washington. That’s helped Griffin get competitive with Jones, a rare accomplishment for a primary challenger. And as the May 6 election approaches, Griffin’s got the connections to bring in a lot more money. Like Mitch McConnell, he is a classic example of a candidate who could benefit in a very big way from the Citizens United and McCutcheon rulings. Walter Jones will have a harder time tapping top Wall Street donors than Taylor Griffin—in no small part because of the incumbent’s record of saying “no” to the banks.